There is no doubt that Tiger Woods is back after he secured his fifth Masters victory on Sunday. But is his aura back? Although that is more debatable, it sure looked like it during the final round as several other contenders folded like cheap tents in Tiger's presence. The 15-time major champion isn't-and never was-done. But are the Lightning done? Are the Thunder? Are the 76ers? Questions abound on the ice and the hardwood. All odds provided by Bovada Sportsbook . Francesco Molinari . Tiger had at least a share of the 54-hole lead in each of his first 14 major triumphs. On Sunday at Augusta National, the 43-year-old trailed Francesco Molinari by two shots at the beginning of the round and by three after six holes. But the reigning British Open champion was wet with his tee ball on the famous par-3 12th. So was the third participant in the final pairing, Tony Finau. Brooks Koepka was, too. As was Ian Poulter. Molinari eventually carded a double-bogey on 12 and did the same on the par-5 15th after going into the water again. "I think I made a few new fans today with those two double-bogeys," Molinari said with a smile. With Molinari done, Koepka and Dustin Johnson were the last two contenders for the green jacket, but both missed key putts on the closing holes. "The mistake Francesco made there let a lot of guys back into the tournament," Tiger noted. "Myself included." Tiger is a +700 favorite to win the PGA Championship next month; Molinari is a +1600 sixth choice. Philadelphia 76ers . Well, that is not how the 76ers could have envisioned their playoff opener going. In Game 1 of their Eastern Conference first-round series against the sixth-seeded Nets this past Saturday, Philly suffered a 111-102 home loss. Starters Ben Simmons, Tobias Harris, and J.J. Redick all finished in single-figures, while Joel Embiid and Amir Johnson got caught looking at a cell phone while on the bench. Philadelphia is a -8 home favorite in Game 2 on Monday. Paul George . 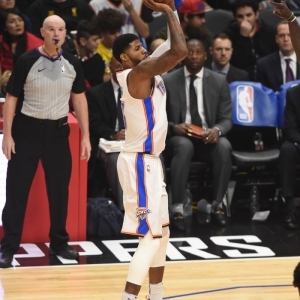 George missed Oklahoma City's regular-season finale, seemingly as a precautionary measure due to a bum shoulder. But is it worse than expected? Adding insult to injury, the Thunder lost Game 1 at Portland 104-99 on Sunday afternoon. George went for 26 points and 10 rebounds, but he could not throw it in the ocean throughout the first half and he finished with a grand total of zero assists. "Four days ago I couldn't even lift my shoulder," George explained. "Fast forward to today; it was the first day I shot the ball. With me, it's just rhythm…. [At practice on Monday] we'll get shots up and get back in tune. We'll try to get the same looks that we got (in Game 1)." The Thunder are +2 road underdogs in Game 2 on Tuesday. Jalen Mills . The Eagles' cornerback got into a fight with Wizards forward Devin Robinson outside a nightclub in Washington, D.C. last weekend. Both guys were charged with disorderly affray, which basically means fighting in a public place. On the bright side for Mills, Robinson apparently got the worst of it. The 6'8'' forward was taken to a hospital for treatment and the Wizards promptly announced that they will not make him a qualifying offer for 2019-20. The Eagles are +1400 to win the Super Bowl. Tampa Bay Lightning . Tampa Bay compiled the best record in the NHL by a mile and played like it for the first 20 minutes of the playoffs, leading Columbus 3-0 after one period of Game 1. Shockingly, the Lightning collapsed en route to a 4-3 loss and went on to drop both Game 2 at home and Game 3 on the road. "You're feeling pretty good about yourself when you're up 3-0 and then you kind of giftwrap that one for them," head coach Jon Cooper reflected. "It was a tough last 14 minutes of the third period (of Game 1) and the problem is it carried into Game 2…. Adversity hits in different ways and we haven't had a lot of it in the regular season and we have it now." Adversity? That's putting it mildly. The Lightning are one Game 4 loss away from becoming the first team in NHL history to win the Presidents' Trophy and then get swept in round one of the playoffs. Tampa Bay is +1100 to claw back and take the series…and go on to win the Stanley Cup. Seattle Mariners . Seattle is sporting the second-best record in baseball (13-5) behind Tampa Bay. So, what's not to like? Well, the Mariners were once 13-2 and way out in front in the American League West. They have since lost three in a row-all to division rival Houston. The Astros have restored order to the proceedings by winning a total of nine straight on the heels of 2-5 start. They are now 11-5 and just one game back of Seattle. The Mariners (Kikuchi) are -105 home underdogs against Cleveland (Bauer) on Monday night. Manchester United . FC Barcelona went into Old Trafford and beat host Man United 1-0 in the first leg of their Champions League quarterfinal showdown last Wednesday. Luke Shaw scored an own goal when he deflected a Luis Suarez header into the back of the net during the 14th minute. That was the Red Devils' second loss in a row, having fallen to Wolverhampton in an English Premier League upset the previous week. They at least managed to beat West Ham during Premier League action this past weekend. Man U is +4000 to win the Champions League and +200 to finish in the top four of the EPL.